Contemporary sociology increasingly seems to be adopting a perspective similar to that on which Georg Simmel's analysis and interpretations rested. To a significant degree, therefore, sociologists continue to turn to Simmel for a basic understanding of the forms and processes of social life. 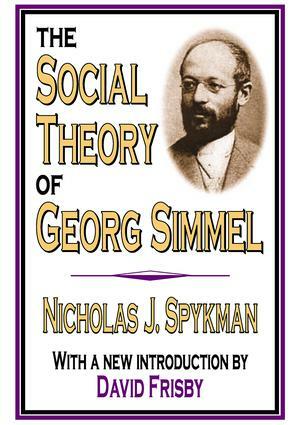 Nicholas Spykman's The Social Theory of Georg Simmel, originally published in 1925, was the first comprehensive account of Simmel's ideas. It remains a most valuable summary of the major elements of his thought.Spykman wrote this study for a specific purpose: to indicate Simmel's conception of the relations between different fields of theoretic inquiry into socio-historical actuality; to make Simmel's contributions to the methodology of the social sciences understood; and to illustrate Simmel's conception of sociology as a science. He shows that Simmel was primarily a social philosopher interested in a functional understanding of socio-historical realities, art and economic values, morals and aesthetics, religion, and the function of money. Spykman identifies three major phases in the development of Simmel's thought: the first is primarily occupied with methodology and the presuppositions of the social sciences; during the second he wrote several essays containing philosophic interpretations of modern civilization; and the third culminated in his metaphysics of culture.The Social Theory of Georg Simmel, graced with a new introduction by David Frisby, one of the foremost contemporary Simmel experts, is an outstandingly organized, coherent presentation of the complex and subtle ideas of one of the intellectual giants of modern sociology.